Congratulations to ‪Alisa Rosales‬ on winning our ninth High Five Giveaway and thank you to all who entered. 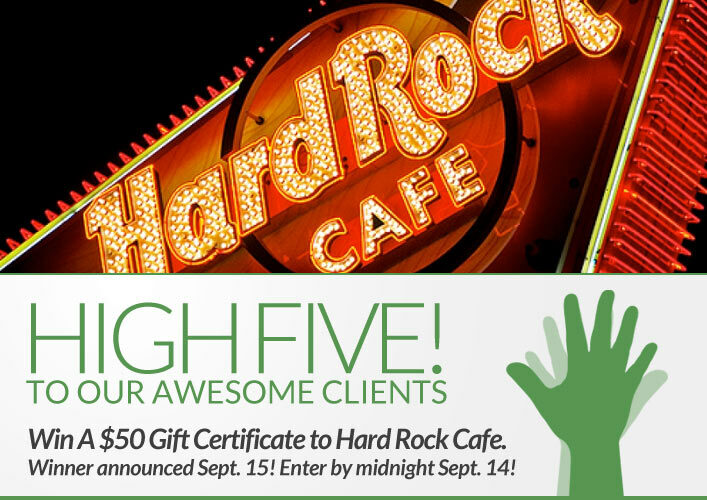 Our next High Five Giveaway is for a $50 gift certificate to Hard Rock Cafe! What very popular coffee shop is directly across the hallway from XEX in the Leo Burnett Galleria of Shops? Now, just add a comment to this post with the right answer to be eligible to win! The winner will be announced on Saturday, September 15. Entries must be received by midnight on Friday, September 14. Good luck! Starbucks, Grabbed a Latte after my Hair cut Tuesday. Starbucks..of course!! Who could ask for more…getting your hair done at XEX while enjoying a delish drink that you picked up on the way in!! !